It finally got here. The day to hang my quilts. There were 4 of us and we all had a good time. It looks amazing. Yeh! Rejoicing! What I didn't have is the names of the quilts and a price list. Any ideas on how to do this? I thought I'd make a complete list with prices and my phone number so people could take a copy of the list and call me. The bank had some nails in the walls for framed pictures. Of course, this won't work for quilts with a hanging rod. They wouldn't allow additional nails. We used Command Strips by 3M. I'm nervous that they could fall. I think I'll go look tomorrow. First Time for Everything. UMMM. My Ears Still Ring.... Old song, for what it's worth. We celebrated by having lunch at 3:00 pm. Then had to buy new tires for the car. Hope to sell some quilts. Can you print pamphlets with picture of the quilts with a price list? I would have a brief bio of each quilt with the name, price and telephone number. Have them on a little table as people come in. If that isn't possible, maybe make little cards with the name, price and phone number to pin to the quilt edge? How exciting for you! Please do post photos. What a nice event for you; I hope it's profitable. Would like to see the quilts. I would like to see photos too !! Sounds so exciting for you too !! Congratulations on your one woman quilt show. Great news - I would go with a brochure as well, something people can take with them with your contact info on it, for future reference. Reminds me of a 2 person show DH and I had at a crafts organization. We had most of the quilts (wall size) hung in a conference room. Then the office person came in and said we had to hang everything at eye level of someone in a wheel chair. So we took them all down and wound up hanging them at about 3-4 feet from the floor. Didn't make sense to me but I did as I was told. So exciting! Please post pictures ... would love to see your work. Wishing you great success! Great that you have a venue for your quilts. I hope you sell them! New tires....ouch! Try the HANG IT DANG IT holders...they are perfect for quilts and only one nail per hanger. Good Luck! How wonderful...can't wait to see pictures. Have you tried mesuring how far apart the nails are? Perhaps you could use dowels cut to that length with screw eyes on the ends, then afix the dowels to the nails. I like the list of quilt cost and also you can put those on the display quilt, just as they do in quilt shows. Best of wishes and have fun! What a fantastic idea! I'm hoping that the 3M hooks work well for you. I would place a card with name/price for each and then do business cards on the computer with your contact info...these can also be placed at your local grocery store bulletin boards. I'd do a pretty, detailed color info sheet for the grocery store to send people to the bank, too. All free advertising, minimal cost for business cards. =) best of luck! Due to the security at the Bank I couldn't take a picture of the whole show that was behind the tellers. The color of the wall is taupe, not pink, cream or grey. 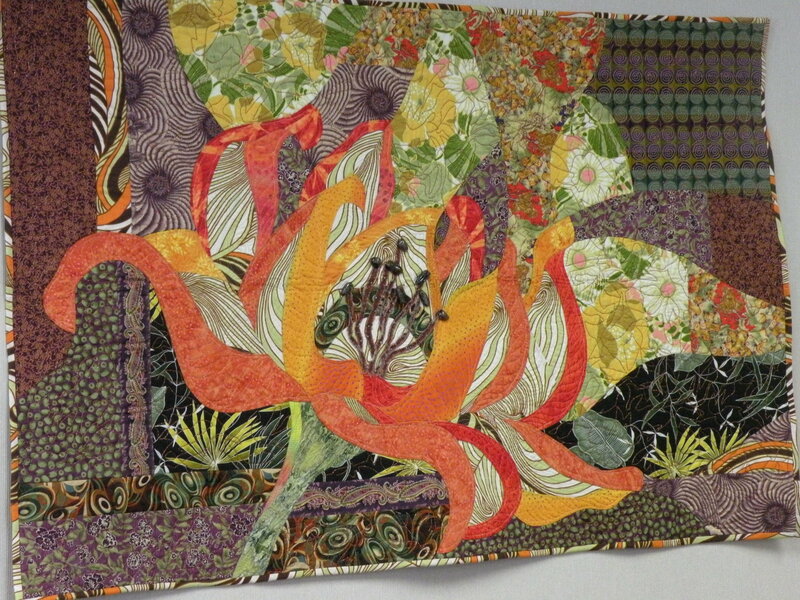 Beautiful quilts! What a great opportunity and sounds like fun, too. Best of luck selling your quilts. 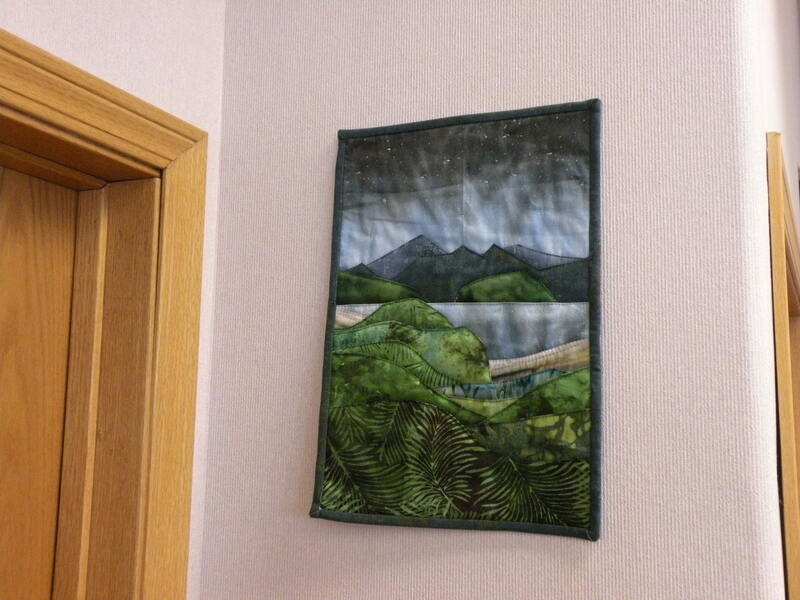 Oh my, those are fabulous wall hangings, hope you do well selling those, wishing you the best! Well, wow!!!! Those are beautiful! 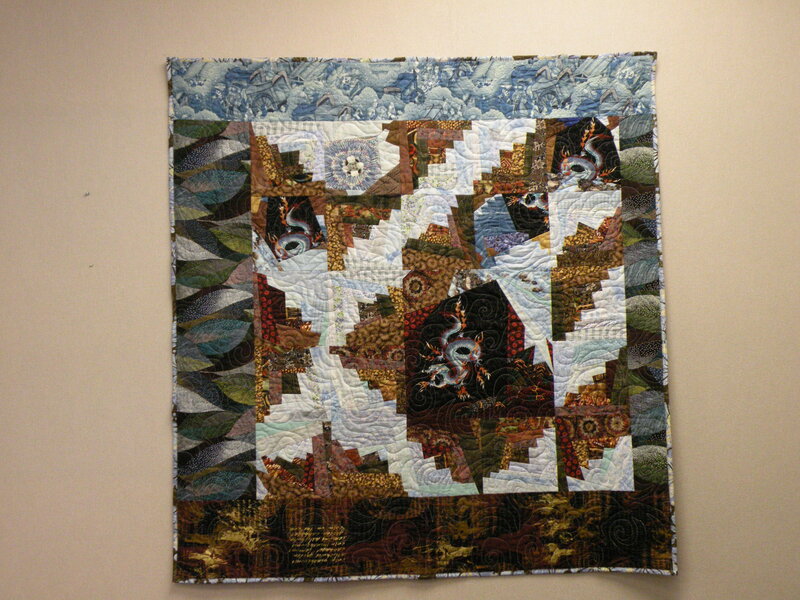 wonderful quilts! hope you do well in selling them.